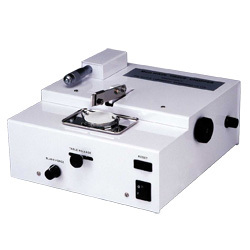 The McIlwain Tissue Chopper has been designed to prepare samples of tissue for metabolic experiments and is particularly suitable for small and irregular samples for biopsy or from small organs. For Neuroscience it offers the opportunity for rapid chopping of tissue such as hippocampus, which is relatively flat, and will not suffer excessive stress damage. The McIlwain also has applications in organotypic slices and for preparing tissue for immunology studies. For slicing cortical or sub-cortical regions, our vibrating microtomes provide more precise and gentle slice sectioning. The tissue chopper is also good for preparing cell cultures from the brain of young animals. Its operation is such that it will cause much less disturbance of cell structure than would a blender or homogeniser, and it can be used on fragments which would be difficult to cut by ordinary methods. Typical applications are for liver, kidney and parts of the central nervous system. Preparation of 1mm thick slices or cubes and prism samples can be prepared in 30 seconds. The Chopper offers stepless variation of slice thickness from zero to maximum by means of an indexing clutch in conjunction with micrometer head calibrated in microns. The specimen is placed on the circular stainless steel table; the table is traversed automatically, at a speed, which can be varied, from left to right. During this travel the chopping arm, with blade, is raised and dropped, at speeds of up to 200 strokes per minute. As the table carrying the specimen passes under the blade it is chopped into the desired slices. If prism shaped pieces are required the table is returned to the left hand side of the machine, rotated through 45°, and the process repeated. To prepare cubes the table is rotated through 90° for the second chop. A safety limit switch is fitted to prevent the machine overrunning and a quick return mechanism is fitted for the return of the table. The Chopper offers stepless variation of slice thickness from zero to maximum. The specimen table is traversed automatically from left to right at a variable speed. During travel the Chopping Arm is raised and dropped at speeds of up to 200 strokes per minute. A safety limit switch prevents overrunning and a quick return mechanism is fitted for the return of the table. Safety: By the nature of its use this machine does NOT have any guards around the cutting blade. In the interest of safety, care must be taken during use. At all times keep hands clear of the blade and cutting table when the machine is switched on. It is recommended that the blade be removed when the machine is not in use. Modification allows usage of a standard 60 mm petri dish instead of the chopping disc. Unit comes with two sample blades.